(Clockwise, from lower, left, below the sea): Mango trees on Lake Surprise near Biscayne Bay and the Florida Keys. ::: Miami Beach, where the elite meet to greet in the heat. ::: A church in Appalachicola, which was shipped to this panhandle city from New England. ::: a gull wading off of Tavernier Key. ::: Talk about living on the beach, this guy's front lawn, driveway - and surely his living room - are all sand! But, could I live there? - Could I? Heck, I did just that for 15 years! Riding around this country for the past year, I found many beautiful places to live, but the more I saw, the more I missed Florida. I'm just a sucker for tropical breezes, brilliant sunshine and the big, beautiful sea. 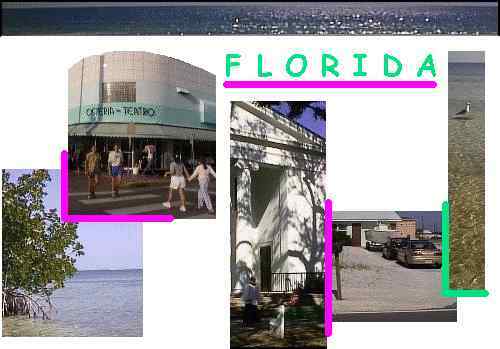 On this trip, I saw places in Florida I had never seen before and I would like to see again, if you know what I mean. Could you live in a town where you have to set your clock each time you cross the street? These people do!